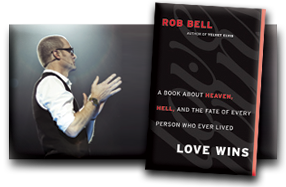 Rob Bell is a preacher, pastor, author and leading thinker on theological issues. Earlier this year, he wrote a book called “Love Wins” which caused a huge controversy (buy it at Amazon or Amazon.co.uk). One of the upsetting things was the number of detractors who were prepared to “critique” his book without even reading it. Insane, but true. I was sent one which was even printed in the best selling Christian magazine in South Africa where the reviewer freely admitted he hadn’t read the book. Apparently, people who attend Rob’s church in Grand Rapids were put upon by all and sundry and had a torrid time trying to defend their pastor. On 27 March 2011, Rob started the service with a statement which he labelled “The Agony of Explanation” in their official podcast. I think it is a remarkable few minutes. He states his beliefs. And there is nothing in any of his books which would contradict this very traditional set of beliefs. He then talks a bit about what he was trying to convey in the book. If you’re not going to read the book, you might as well listen to what he says the message is. He also talks a lot about the attitude one should have. An attitude like Jesus’, I believe.